Cody Willoughby | AIM Media Midwest Liz Smith, co-proprietor of Poppin’ Off Popcorn, hangs T-shirts available for purchase ahead of the store’s Friday opening. The new location will offer custom popcorn, ice cream, craft sodas, and more. TROY — The downtown district is soon to be flourishing with flavorful fluff as its newest business, Poppin’ Off Popcorn, prepares to open its doors on Friday at 4 p.m. The new shop, located at 125 S. Market St., spawned from proprietor Liz Smith’s love of the culinary arts, as well as a shared interest with her husband, Mike, to engage in personal entrepreneurship. Poppin’ Off officially opened for business in November 2017, after the Smiths perfected a variety of flavors. Marketing their product on Facebook Marketplace, Liz and Mike sold popcorn out of 3 Weird Sisters and the Downtown Troy Farmer’s Market throughout 2018, as well as pop-up sales at Lunch at 4 W. Main St. As sales began to increase, particularly through custom orders for large groups, the Smith realized they needed a storefront. The shop will begin with 20 regular popcorn flavors available for fresh purchase in the shop, with approximately 100 flavors to choose from for custom orders. Regular popcorn flavors will include movie theater, old fashioned, caramel, cheesy cheddar, Chicago-style, salted bourbon caramel, rainbow, Troy mix, salt & vinegar, strawberry, white cheddar, “It’s a Big Dill,” buffalo wing, backyard BBQ, cheesy bacon, jalapeno cheddar, Cincinnati chili & cheese, birthday cake, Buckeye, caramel nut cluster, turtle, cookies & cream, lemon cream pie, and salted peanut butter. In addition to popcorn, the Smiths will offer a dozen flavors of scoopable ice cream from Toft’s, a dairy parlor from Smith’s native Sandusky. Starting ice cream flavors will include vanilla, chocolate, strawberry, rainbow sherbet, peanut butter cup, cookies n’ cream, rocky road, mint chocolate chip, moose tracks, brown butter bourbon truffle, salty caramel fudge truffle, and peanut butter cheesecake. Poppin’ Off will also feature a small selection of craft sodas and other miscellaneous beverages. Smith also voiced an interest to sell other delectable assortments on a seasonal basis. The Smiths also own a property in Vandalia where they hope to open another location in the coming years. Regular store hours will be 11 a.m. to 7 p.m. Tuesday through Saturday, and 11 a.m. to 5 p.m. Sunday. In addition to their regular store hours, Liz and Mike intend to be present at the upcoming Miami County Food Truck Rally at the fairgrounds on Saturday, May 18, and will continue with pop-up sales at Lunch at 4 W. Main St. during events in the Public Square. For more information, visit www.poppinoffdayton.com. 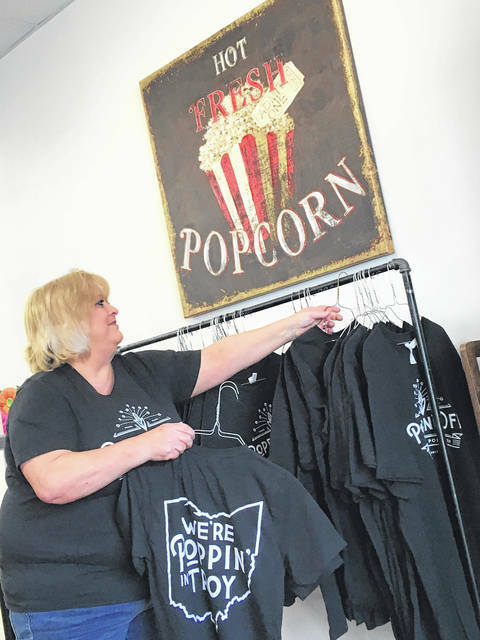 https://www.dailycall.com/wp-content/uploads/sites/30/2019/03/web1_Popcorn1-1.jpgCody Willoughby | AIM Media Midwest Liz Smith, co-proprietor of Poppin’ Off Popcorn, hangs T-shirts available for purchase ahead of the store’s Friday opening. The new location will offer custom popcorn, ice cream, craft sodas, and more.